U.S. Marine Corps leaders are ready to switch software operating systems in a radar system designed to protect Marines on attack beaches from rockets, artillery, mortars, cruise missiles, unmanned aerial vehicles (UAVs) and other low observables. Over the past couple of years there has been talk of mobile-desktop convergence from various mobile and desktop OS providers. As a general concept, this sounds fantastic! Unfortunately once we dive into things a bit deeper, it appears this is easier said than done. Docker is all the rage among hip startups and early adopters, but Docker the company would like to get its tech into enterprises, too – which is why it’s working on adapting its hosted Docker Hub service into a product specifically targeting large business customers. Success can build a feedback loop that sustains its own momentum, making those who are successful certain they are doing the right thing. I don’t want to charge Docker with such hubris, but recent events illustrate why open source code projects function the way they do. A Reddit AMA last week with Greg Kroah-Hartman, Linux kernel developer and Linux Foundation Fellow, went beyond the usual questions about his workstation setup and job description. Much of that was preempted by Kroah-Hartman’s lengthy list of resources where the un-initiated can find his previous writing and presentations on those topics. Instead, he was able to answer more timely and specific questions which ranged from his thoughts on specific kernel patches, to the overall development process, to personal questions about his family, work habits and favorite beer. Below is an edited digest of some of the best responses. Visit the r/linux subreddit for the full AMA. Linus Torvalds has pressed the go button for a new release of his eponymous kernel. Linux version 3.18 was loosed on Sunday, US time, after what Torvalds wrote was a “tiny” patch to get release candidate 7 done. The release of Mesa 10.4 is being dragged out by a few days due to a regression affecting older GPUs/drivers that causes this new Mesa version to be in bad shape. Hopefully by the end of this coming week though, Mesa 10.4.0 will be christened. Pekka Paalanen, the Collabora developer who has effectively been serving as the Wayland/Weston release manager with Kristian Høgsberg still being away from Wayland development, is seeking some discussion from Wayland developers about their intended view of Wayland’s Weston compositor and what direction it should take moving forward. Just a few days after the NVIDIA 343.36 Linux driver release, NVIDIA has outed the next beta in the NVIDIA 346 Linux driver series. PhpMyAdmin is a famous tool written in PHP and it’s built to handle the administration of MySQL databases. The developers have just released a major upgrade that should prove to be quite interesting. Data recovery is the process of salvaging and handling the data through the data from damaged, failed, corrupted, or inaccessible secondary storage media when it cannot be accessed normally. Often the data are being salvaged from storage media such as internal or external hard disk drives, solid-state drives (SSD), USB flash drive, storage tapes, CDs, DVDs, RAID, and other electronics. Recovery may be required due to physical damage to the storage device or logical damage to the file system that prevents it from being mounted by the host operating system (OS). After the BioShock Infinite SteamDB entry was found by Linux users we’ve been debating who’s going to be behind the port and it might very well be Virtual Programming. Prepare for some speculation. iO is a new type of 2D platformer developed by Gamious and published on Steam by KISS ltd. A Linux version was also made available, along with the support for the other platforms. It’s been quite some time since the Randa Meetings 2014 and even this year’s edition of the KDE Community Summit called Akademy has already happened, but it’s still nice to look back and see what was accomplished at this KDE Tech Summit in the middle of the Swiss Alps. Porting Fcitx KCM to KF5 is not that easy. It’s not only about porting kcm itself, but also porting missing part of fcitx-qt5 to Qt5 (mostly widgets). The old pkgconfig file is quite messed up, so I decided to experiment with extra-cmake-modules (ECM) a bit. Our recent ownCloud Client 1.7.0 release contains the new feature of overlay icons in GNOME nautilus, MacOSX and Windows. That is nice, but that makes us as old KDE guys sad as Dolphin was missing on the list. What is Ultimate Edition 4.3? Ultimate Edition 4.3 was built from the ground up debootstrapped from the Ubuntu 14.04 Trusty Thar tree using Tmosb (TheeMahn’s Operating System Builder) which is also included in this release. This release is a Long Term Supported (LTS) release, supported until the year 2019. This release is most certainly worthy of the Ultimate Edition title. I personally hate KDE, and found it very visually attractive in all its “Wobbly Windowness” that I miss from the Mate desktop environment. I must admit I do miss the eyecandy that it provides off the rip. I have included many, many tools I am constructing that reside under the hood of virtually all Ultimate Edition releases, most newer and upgraded. I am happy to announce the fourth and the last this year iso images of SparkyLinux 3.6 “Annagerman” LXDE, MATE, Razor-Qt and Xfce. At the beginning, I’d like to thank to all of our small but strong community members for their help with searching and solving bugs and problems. So just what is the relationship between red-hot container company Docker and open source stalwart Red Hat? Are the two companies on the same side, or not? Do Docker containers complement or compete with Red Hat’s Linux offerings? To get some answers, I talked with Paul Cormier, Red Hat’s president of products and technologies, and he had some pretty strong opinions on the subject. But it all boils down to Red Hat’s position that container technology (and Docker) simply isn’t the be-all and end-all that many people seem to want it to be—at least not in the enterprise. Fedora’s Live USB Creator, aptly named liveusb-creator, hasn’t seen much attention recently but with Fedora 21 due out tomorrow it was updated just in time. The latest version, liveusb-creator 3.13, is now available in the Fedora repositories. We knew it was possible; the signs were all there. The Systemd Inferno, after all, had been raging for far too long. But more than a few of us were still holding out hope. “Things will surely get better,” we thought. MX-14, a fast, lightweight, and easy-to-install Linux Live CD distribution based on Debian stable, for Intel-AMD x86-compatible systems, has been upgraded to version 14.3 and is now available for download. The Ubuntu devs are considering upgrading the GTK+ packages to the latest 3.14 version, which was made available just a couple of months ago, a decision that would really help a number of other Ubuntu flavors as well. Linux Mint 17.1, which was officially released on Nov. 29, provides users of the popular Linux desktop with an incremental update and some additional polish. Code-named Rebecca, Linux Mint 17.1 offers a choice of desktop user interfaces, the two primary ones being MATE and Cinnamon. The MATE desktop is a fork of the GNOME 2 desktop environment. The GNOME Linux desktop community moved to the GNOME 3 desktop in 2011, a move that some desktop users did not embrace. In the Linux Mint 17.1 MATE edition, support has been added for the Compiz window manager, which can enable a desktop with multiple special effects for window transitions and events. The Cinnamon desktop, which was created by Linux Mint creator Celement Lefebvre, provides users with a familiar GNOME 2 look but also adds some of the advanced capabilities of newer GNOME releases. Linux Mint 17.1 builds on the innovations that first debuted in Linux Mint 17 earlier this year, with usability, interface and performance gains in several areas. In this slide show, eWEEK takes a look at some of the improvements in the Linux Mint 17.1 release. The Raspberry Pi team is on fire (in a good way), making new Raspberry Pi models faster than we can review them. Allwinner unveiled a $6 “H3″ SoC targeting $35 to $50 OTT STBs, featuring four Cortex-A7 cores, a Mali-400 GPU, 4K HDMI output, and 5MP camera support. Android and Linux are the most likely platforms here. The Gear VR, Samsung’s virtual reality headset, is now on sale through AT&T and Samsung’s US sites. The $199 headset fits around a Galaxy Note 4 smartphone, turning it into a mobile VR display. It was originally announced in September, but it’s so far only been slated for a vague early December launch, though it’s been available to try at a handful of malls around the country. The Gear VR was built in partnership with Oculus, and it incorporates a tracking sensor from the first Oculus Rift development kit, as well as a custom “Oculus Home” interface app. Unlike the Rift, though, it’s wireless and fairly light, and if you’ve already got a Note 4, it’s somewhat cheaper (if you don’t, you’ll have to add an extra $800 to the price above.) While it’s more polished than the current version of the Oculus Rift, however, it’s still an “Innovator Edition,” so be warned that you’re still essentially participating in a mass beta test of virtual reality. Every once in a while, an unexpected combination of circumstances ends up enabling us to do something pretty awesome. This is the story of one of those times. About a year ago, a member of the Replicant community started evaluating a few targets from CyanogenMod and noticed some interesting ones. After some early research, he picked a device: the LG Optimus Black (P970), bought one and started porting Replicant to it. After a few encouraging results, he was left facing issues he couldn’t overcome and decided to give up with the port. As the device could still be an interesting target for Replicant, we decided to buy the phone from him so that I could pick up the work where he stalled. Commercials for Amazon’s crappy phone in Amazon Prime videos? If you want your phone to sell, make it better. If it’s as good as other Android-based phones or as good as the iPhone then people will buy it. But you DO NOT disrupt someone’s TV show to peddle your second-rate phone or any of your other products. I canceled Amazon Prime tonight. If you want my business back, Amazon, then make sure you remove all commercial interruptions from Prime programming. Otherwise, I’ll be using Netflix exclusively. If I wanted commercials, I’d watch network TV or cable. There are lots of Android phones out there, but sometimes it’s hard to separate the wheat from the chaff. Fortunately, Android Central has a holiday guide to help you complete your Android shopping list. These are the best Android smartphones that are currently available. Price listed is for each carrier’s monthly payment over 24 months. Up-front, on-contract pricing will be higher, usually between $100 and $300, depending on the phone. Click through to each carrier’s listing for off-contract costs. Channel 4 is using MuleSoft open-source Enterprise Service Bus (ESB) in order to more efficiently share information on application program interfaces (API) with businesses outside the broadcaster. SK Telecom has completed the development of an open-source Internet of Things platform based on OneM2M, the M2M and IoT standards partnership, Business Korea reports. SK Telecom launched an M2M platform in 2008. The operator has also participated in the development of open-source platform Mobius from late 2011 as a national project, together with the Korea Electronics Technology Institute and Ntels. As oneM2M announced a candidate for an IoT/M2M standard in August of this year, SK Telecom implemented the standard with the Mobius, finishing the development of a commercialization-ready platform. The slides and videos from the 2014 LLVM Developers’ Meeting that took place in San Jose at the end of October are now online. There continues to be very strong demand for web and application development skills in the job market, and there is especially demand for people familiar with open development tools. One of the biggest trends going among developers is leveraging browser extensions focused on developers. Interested in keeping track of what’s happening in the open source cloud? Opensource.com is your source for what’s happening right now in OpenStack, the open source cloud infrastructure project. Mesosphere will accelerate development of its data center operating system with $36 million in funding it received in a round led by Khosla Ventures, one of the Silicon Valley’s most respected venture capital fims. In June, Mesosphere raised $10 million in a round led by Andreessen Horowitz. The DCOS also includes common OS features one would would find in Linux or Windows, like a graphical user interface, command-line interface and a software-development kit. Errplane founders Paul Dix and Todd Persen had an idea for a company last year around anomaly detection in data center monitoring, but they soon realized that field was crowded and it would take a long time to build out the infrastructure for the company. At the same, time they heard from customers they were more interested in the underlying infrastructure than the service they were offering, and they did something brave. They decided to pivot and build an open source product that would meet the needs of the entire market, rather than try to compete directly. OpenMotics is an open source home automation hardware and software system that offers features like switching lights and outputs, multi-zone heating and cooling, power measurements, and automated actions. The system encompases both open source software and hardware. For interoperability with other systems, the OpenMotics Gateway provides an API through which various actions can be executed. Australian businesses lose over $65 billion a year from data loss and downtime per year, according to major new global study. Storage vendor EMC has published its annual global Data Protection Index, which includes data specifically on Australia. It found that more than three quarters (78%) of Australian IT professionals are not fully confident in their ability to recover information following an incident, and that 58% of organisations in Australia still lack a disaster recovery plan for emerging workloads, and just 7% have plans for big data, hybrid cloud and mobile. Why aren’t more news outlets covering Sen. Rockefeller’s shameful attempt to kill FOIA reform? WIKILEAKER Julian Assange is entering his fifth year as a man with a travel toothbrush and the heavy weight of legal charges over his head. Assange is languishing in luxury or spending his time between chair and treadmill, depending on who you listen to. He most certainly is not at liberty, however, and has been living in a room at the Ecuadorian embassy. Almost immediately after the animal welfare group Compassion in World Farming released a video exposing the “humane” (read: atrocious) conditions for chickens raised on a factory farm for Perdue, the poultry giant audited the farmer who opened his doors to the cameras. The Pentagon — the climate elephant: Expose the Pentagon, the world’s largest & most dangerous climate criminal! There is an elephant in the climate debate that by U.S. demand cannot be discussed or even seen. This agreement to ignore the elephant is now the accepted basis of all international negotiations on climate change. It is well understood by every possible measurement that the Pentagon, the U.S. military machine, is the world’s biggest institutional consumer of petroleum products and the world’s worst polluter of greenhouse gas emissions and many other toxic pollutants. Yet the Pentagon has a blanket exemption in all international climate agreements. There is a huge disparity amongst UK professionals around their attitudes to digital literacy and skills, with 40% admitting they have average to poor digital knowledge. 16.1 million children in the United States are currently living in poverty. “When a senior Parliamentary Committee says that the current legislation is not fit for purpose, then this simply cannot be ignored. It is now abundantly clear that the law is out of date, the oversight is weak and the recording of how the powers are used is patchy at best. The public is right to expect better. “The conclusion of the Committee that the level of secrecy surrounding the use of these powers is permitting investigations that are deemed ”unacceptable in a democracy”, should make the defenders of these powers sit up and take notice. At present, the inadequacy and inconsistency of the records being kept by public authorities regarding the use of these powers is woefully inadequate. New laws would not be required to correct this. HASC concludes that surveillance legislation is “not fit for purpose”. The Home Affairs Select Committee has published a report today into the use of the Regulation of Investigatory Powers Act 2000, concluding that the legislation “is not fit for purpose” and “needs a complete overhaul”. It should be obvious why we need SPDY. Ever since Edward Snowden demonstrated that Internet paranoia is justified, a stream of discoveries has made always-on, end-to-end encryption even more desirable. The recent move by the Electronic Frontier Foundation, Mozilla, and others, who announced they will back a new nonprofit to promote and enable secure communications on the Internet, was welcome – by most of us. For a while now, we’ve been covering various legal challenges in Europe related to the GCHQ’s surveillance activities. One of the main cases, brought by Amnesty International and Privacy International, argued that the surveillance violated the European Convention on Human Rights (specifically article 8, on right to privacy, and article 10, on freedom of expression). While it was always expected that the case would eventually go to the European Court of Human Rights, the first step was the Investigatory Powers Tribunal in the UK — a secretive court that reviews complaints about surveillance, but (as with nearly all “secretive courts” charged with “oversight” on the intelligence community) almost always sides with the intelligence community. Between 2000 and 2012 the IPT only sided against the intelligence community 10 times out of 1468 cases brought (about half of one percent of all cases). In other words, this is a court that (in secret) regularly okays GCHQ’s surveillance efforts on UK citizens. THE UK COURTS have found that GCHQ’s Tempora system is legal in principle under the inglorious Regulation of Investigatory Powers Act. Pressure group Privacy International challenged Tempora in the courts, and this weekend it got its answer. It did not like it. The NSA’s bulk phone metadata spying program was renewed for another 90 days, the fourth time the warrantless snooping has been reauthorized following President Barack Obama promising reform last January, the government said Monday. The white New York City police officer who put unarmed black Staten Island resident Eric Garner in a chokehold moments before his death has been accused by other black men of violating their civil rights while he was on patrol. A grand jury’s decision on Wednesday not to indict officer Daniel Pantaleo for his role in the videotaped confrontation that left 43-year-old Garner dead has sparked days of protests by groups claiming U.S. law enforcement unfairly targets African-Americans and other minorities. The Ukip leader, Nigel Farage, has blamed his late arrival at an event on immigration. He was due to appear at a “meet the leader” drinks reception as Ukip prepared to host its first Welsh conference. But he was running more than two hours late and failed to show. Federal prosecutors say they will review an incident in which a Seattle police officer punched and seriously injured a handcuffed, intoxicated woman, after King County prosecutors said Friday they won’t charge the officer. Now, if this were a one time thing, it might not even be that noteworthy. But this seems like fairly common practice at airports. A few years ago, we wrote about TSA agents stealing iPads and stories of TSA agents and baggage handlers stealing stuff from luggage are not at all hard to find. In fact, reports from a few years ago noted that over 400 TSA employees have been fired for stealing from passnegers in the past decade. Seven bag handlers at Kennedy Airport have been charged with stealing electronics, jewelry and other items worth more than $20,000 from checked luggage, Queens prosecutors said Wednesday. The mantra often heard from Hollywood’s leaders is that pirates are thieves. However, not all people in the industry feel that way. Today we present the views of four regular filmmakers on this controversial topic, what the impact is on the industry, and what can be done in response. Russian officials have expressed caution over proposals to introduce an Internet tax to compensate copyright holders for online piracy. The proposals, which were put forward by the Russian Union of Rightsholders, are said to be worth around $860m a year to creators. THOSE who have not been paying close attention over the weekend may wish to read yesterday's article about Benoît Battistelli, who last week was reported to have ousted yet another regulator (once again in his very aggression-filled and abrupt fashion). Battistelli is trying to oust his opposition quicker than any opposition is able to take him down. It is a classic sign of collapse and misery — the acts of fallen tyrant. Staff is trying to seek help from the outside (European authorities and anti-corruption groups) and it does so anonymously for fear of retribution. Those who do this publicly under their own name are being tossed out. “Staff is trying to seek help from the outside (European authorities and anti-corruption groups) and it does so anonymously for fear of retribution.”One week ago we heard from an EPO insider. “You are probably aware of what is going on at the EPO,” he said, having followed our long series of articles about the EPO. He sent us a demonstration poster/flyer for last week’s solidarity demonstrations in The Hague and Munich. He further attached a publication (by an unknown group of authors) illustrating the worksphere within the Office. “The background,” explained our source, “is that two colleagues currently face disciplinary measures for their activity as members of the Internal Appeals Committee although persons carrying out such duties are protected against such measures.” This may relate to what we covered some days ago. Battistelli and his cronies are totally out of control. 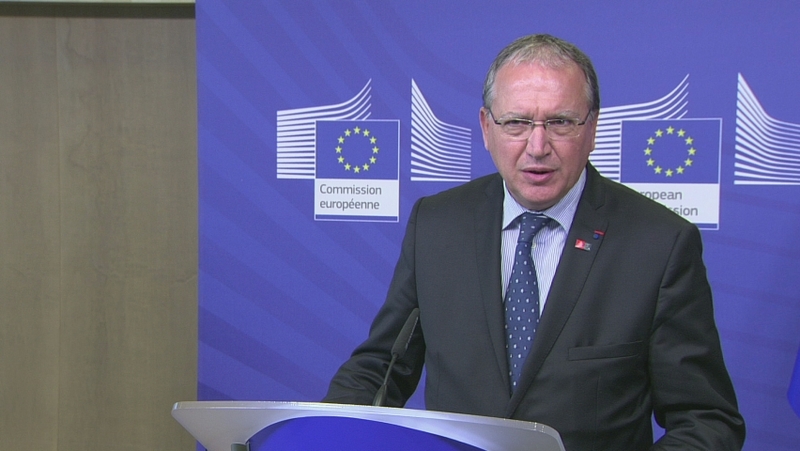 “It is simply another example of an abuse of power of EPO president Benoît Battistelli,” explained our source. Today there is another demonstration going on if all goes as planned. The EPO flyer (pamphlet) is joined by an open letter to the Administrative Council. This is the second demonstration in December alone (EPO staff has been marching in protests for years now, for one reason or another, usually the extension of patent scope, as outlined below). It comes together with an Open Letter to the Administrative Council dated 5 December. If you are not on strike today, it would be good if you could bring a few copies to the Office in order to enhance the oil-spill-effect. Aurélien Pétiaud (Munich, FR) and Michael Lund (The Hague, DK) are members of the EPO’s Internal Appeal Committee nominated by the Central Staff Committee. They have highlighted the deficits in the legal protection of EPO employees with means at their disposal, namely IAC opinions and appeals filed by members of the IAC. This is interpreted as misconduct by the president, who is threatening the two with disciplinary measures, in Aurélien’s case with dismissal. The restrictive policies used and abused have been introduced by Benoît Battistelli (FR) with the consent of the Administrative Council, chaired by Jesper Kongstad (DK). in the 21st century – under the knowing eyes of the governments of the Member States. It starts at 13:00 hrs in front of PH 8. We have nothing to add to that, other than thanking them for so clearly voicing their support. Come and voice your dissatisfaction with the prevailing management by fear and intimidation! The EPO-FLIER wants to provide staff with uncensored, independent information at times of social conflict. 1. If Mr Battistelli thinks that a (career) reform does NOT need to comply with national law, does he take care that it respects any other (labour) law standard, such as the European Convention on Human Rights, or conventions of the International Labour Organization? There is no evidence that he does. Modern democracies usually work by the rule according to a higher law. It means that no law may be enforced unless it conforms with certain universal (written or unwritten) principles of fairness, morality, and justice 2. During the past two years, the president has repeatedly demonstrated that he respects no standards other than his own. He has managed to win the delegations over to support regulations which can only survive in the context of the Office’s immunity 4. He undertakes a structural dismantling of legal recourse. He introduced investigation guidelines that would have made Securitate, Stasi or NSA happy. He undermined the right to freedom of association. When the president introduced the strike regulations, he showed that international conventions ratified by the Member States do not count. He muzzles unions and staff representatives. He abuses powers to discipline dissenting voices 5. He shows a complete disregard for (even unanimous) opinions of the Internal Appeals Committee or the Disciplinary Committees by passing harsher judgment than recommended 4, 6. He repeatedly demonstrated that neither the letter nor the spirit of the Service Regulations count 7. This applies to those parts of the regulations he inherited and even to those he wrote himself 8. 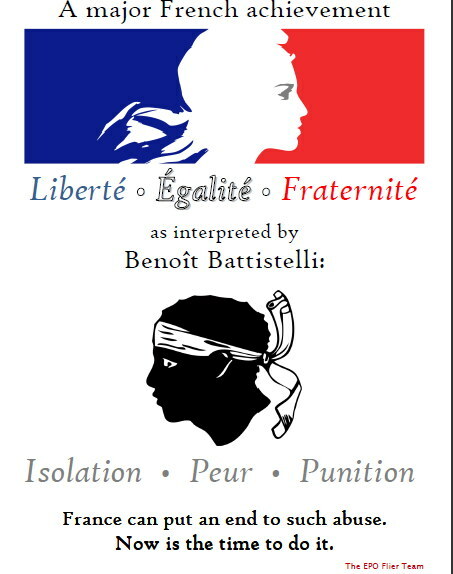 The above clearly shows that – for Mr Battistelli – standards for legal recourse as defined for instance by the European Court of Human Rights do not count. Also public observers, represented by newspapers 9 and patent attorneys’ homepages 10, come to realise that – under the presidency of Mr Battistelli – there is an absence of the rule of law at the EPO. 2. Is the proposed reform useful for the Organisation? Can the EPO examiners – in the absence of the rule of law – still correctly and consistently apply the EPC and Guidelines to patent examination? Can the EPO still fulfill its mandate of providing legal certainty to the public? What does the president have in mind when he talks about “real managers”? Technical expertise is obviously no longer required. Are “real managers” expected to follow the example of our VPs and PDs, who (already) obey and blindly follow our larger-than-life president? 11 An entirely performance-based career system puts managers and employees under pressure to increase production. With the rule of law being absent, and in a working environment being dominated by fear and intimidation, not only ill-motivated managers but also weak and intimidated ones are tempted to put their subordinate employees under pressure to fulfill even the most unrealistic targets. And in the presence of threats, many of them will fulfill these expectations, while lowering the search and examination standards. Mr Battistelli has apparently no respect for the professional attitude of EPO employees which made the European patent system a success. The EPO is not listed at the stock exchange. It is a public service provider. And blotting out professional conscience and ethics produces adverse effects. Some examiners already started distancing themselves from their work. This leads to a lower examination quality, and – consequently – to less legal certainty of the granted patents.12 A consequence of a lack of dialogue. The New Career System was developed without acknowledging receipt of, without discussing, and certainly without taking account of any of the elements and arguments of the career counterproposal of the CSC. If voted by the Administrative Council this week, the New Career System will be introduced without any transitional period. All current EPO staff will be exposed to a radical change of their working contract. For the examiners, this means that – due to the entirely income-based incentives – the EPO abruptly stops rewarding efforts for compliance with the EPC mandate. Being pushed by their managers, they will be forced to fulfill unrealistic targets, and many will react to this pressure by lowering their quality standards for search and examination. Mr Battistelli can consult the spirit of the regulations whenever he runs out of arguments 7. But it would possibly lead to some irritation amongst the patent applicants if examiners – being pressed for time – would rather generally refer to the spirit of the EPC, instead of developing a sound reasoning based on the Articles and Rules of the EPC. Mr Battistelli’s decision to introduce a fully performance-based career system has either been taken on the ground of wrong assumptions, or for ulterior motives. He still insists to introduce this system, against the will of staff, and in an environment where the rule of law is absent. It is already difficult to deliver high quality work in the current hostile working climate. If the New Career System is introduced in its current form, the EPO will no longer be able to fulfill its mandate of providing legal certainty to the public. 3. Is Mr Battistelli good for the Office, for the Organisation? The answer to this question should normally be given by the members of the Administrative Council who are responsible for ensuring good governance in the Organisation. Voting for the New Career System on 11 December would implicitly confirm a mandate to the president to continue on a destructive course. At least some delegations seem to share the discomfort of staff and interested circles. And the EPO employees are not the only ones waiting for their answer. Also the stakeholders of the European patent system and others being interested in intellectual property rights expect an answer to this question 14. The attached Open Letter to the delegations in the Administrative Council, of 5 December 2014, elaborates on the implicit change of patent law entailed in the New Career System. You break every rule of good man-management. You bully your weaker colleagues. You criticise colleagues in front of each other and in front of their officials. They can’t answer back without appearing disrespectful … You abuse that situation. This demoralisation is hidden only from you. People are beginning to feel that everything is a waste of time. You have an absolute duty to change the way you operate. This text will strike a chord with staff at the European Patent Office. What annoys them so much about their president is not only WHAT he is doing, but HOW he is doing it. The EPO is out there with the best when it comes to employing well-educated professionals. And yet the president1 treats this body of decent, intelligent people like fools. He is fooling no one, except perhaps the Administrative Council, but even there it looks more like he is coercing rather than convincing. Mistakes in life usually come back to haunt you. The mistakes this president is making will be no exception. He is setting a ticking time-bomb that has the potential to destroy the European Patent Office the day it explodes. Staff at the EPO understand the complexities of European politics, they understand economical arguments and they understand that change comes to any organisation that has been in operation for as long as the EPO has. 1 There is no reason in English grammar to use a capital letter at the beginning of “president”, and no moral reason either. Reverence does not come with office, but has to be deserved. behind them. It may take ten years or more for some of the judgments in these cases to be finalised, but there will be chaos if the Office loses and is forced to wind back ten years of unacceptable behaviour and decisions. He is risking that the entire governance of the European Patent Organisation will be put into question and that the Office will be subject to political scrutiny at the highest levels. In the meantime, he, at some point, will depart, presumably to a cosy life of retirement divided between Biarritz, or some such luxury coastal town, and Paris. Behind him, he will leave an exhausted, emotionalised, demotivated staff, led by top managers who were weak under his leadership and are unlikely to find their spines back after he left. Today, these managers – these feeble yes-men and yes-women – allow themselves to be reduced to uncritical mouthpieces, pathetically regurgitating the latest mantras coming from the tenth floor of the Isar Building and loyally toeing the party line. They repeat over and over again what they have been instructed to say, but are not able to answer any challenging questions. Can they ever regain credibility as capable managers once Battistelli is gone? The real tragedy of the human condition is not that we all must die, but, rather, that we choose to live by grand illusions, rather than to face our fears. Hence, we fall into the clutches of toxic leaders who promise us the moon, knowing full well they cannot deliver. In the worst of all cases, toxic leaders fall under the spell of their own grand illusions and believe that they can. Battistelli is worse than this. He doesn’t promise the moon; he can’t be bothered with trying to convince us, but prefers straightforward nastiness. Some staff say they cannot afford to go on strike. Can staff afford NOT to go on strike? Please help to distribute this flyer, especially to anyone who may still be hesitating! The Commission had already stressed in 2006 that an innovation-friendly, modern Europe2 urgently needs “IPRs based on tough examination standards for novelty and inventive step. A low-quality patent system is a source of legal uncertainty and litigation”. The Commission’s stated aim of strengthening IP matches the motivation and ethics of EPO examiners since 40 years. The EPO’s career systems so far have secured a predictable compensation package and career progression based on a mix of merit and seniority. This allowed examiners to focus on delivering high quality search and examination in a team effort rather than on competing for the sake of income differentiation. The proposal for a New Career System (NCS) is a strong push for more production. Absolute production already counts more than reliable grants. Priorities are set for best effect on presentation of production to the Administrative Council (AC) rather than for serving the European public. But so far, the seniority-criterion in career-advancement gave examiners – being motivated to deliver work that adds value to society – the necessary leeway to attain reliable quality levels despite management pressure, despite insufficient IT tools and despite short-termist policy-making. Is this about to change? The EPO’s president has already received strong support for the principle of the NCS in the Budget and Finance Committee (BFC). Are you going to decide on 11 December 2014 to introduce an entirely performance-based career proposal? This proposal is based on elements which will shift the focus of attention. Salary increases and bonuses depend only on performance. Seniority will no longer be a balancing factor. Those who do not enter into competition or fail to deliver what is defined by their manager (whose bonus is also dependent on the production achieved), will suffer economic losses. Due to the margin of discretion the examiner can apply, the level of quality is not strictly defined. Applying a higher quality level can be interpreted as excessive by the manager and can lead to a lower appreciation. Securing attractive remuneration will rely on maintaining an individual advantage in competition with colleagues, by comparison of production. motivation. It is not suitable for work requiring cognitive skills. The article (based on an US study) „Patent examiners more likely to approve marginal inventions when pressed for time”3 puts it in a nutshell. Yet, the change will still be purported to be in line with ISO 9001 for compliance with rules set by the Office. But it will not deliver quality results. The interventions in the BFC meeting show that the delegations are not unaware of these issues. It is worrying that most of them still supported the proposal. Low quality patents will harm business, primarily SMEs, private inventors and Universities, since the legal costs for an infringement and/or litigation procedure are so high that they normally threaten their financial foundation. The European Commission, BusinessEurope and epi are observer delegations on the AC of the European Patent Organisation. There appeared to be declining interest amongst the observer delegations for attending AC meetings recently. The intended change in labour law is at the same time an implicit change in the (effect of) patent law. On this there should be stakeholder consultation beyond purely the members of the European Patent Organisation. EPO staff have this year been on strong industrial action including strikes and high profile demonstrations, but Mr Battistelli seems unimpressed. EPO staff has got used to being ignored by the AC delegations. The president has now ensured that the staff’s perspective can no longer be voiced by our elected representatives during meetings of our Governing Body4. Concerned examiners had in mind to present you with a petition signed by the colleagues, but the president’s brisk pace in pushing through proposals did not allow for organising it in time for your meeting, hence this open letter. There now is very little the EPO’s employees can do to fence off the perverse effects – of what on the surface looks like ‘only’ a change to employment conditions – on the quality of patents. Are Member States committed to the Industrial Property Rights Strategy for Europe in the framework of the Lisbon strategy for growth and jobs? If so, we fail to see how at least those amongst you also representing EU Member States could possibly vote for the NCS proposal during your meeting in Munich on 11 December. Please do not support this quality erosion. Vote against.